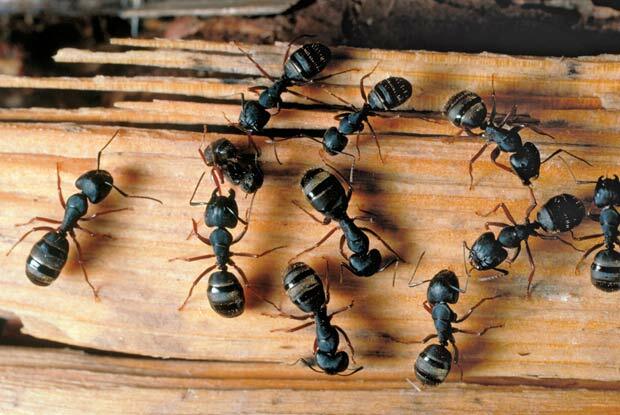 Workers vary in size from 1/8″ to ½” and are black or combinations of black and red. The antenna is segmented, without a club, and the thorax lacks a spine. Ants are generally active along ant trails from April to mid-October. These trails follow natural contours and lines of least resistance and also frequently cut across lawns. Traffic on these trails may be noticeable during the day, but peak traffic occurs after sunset and continues throughout the night. Carpenter ants are more than a nuisance…they “mine” wood to create tunnels and chambers for living space. Although carpenter ants do not actually eat wood, this mining activity damages wood structures and can lead to tricky situations. Carpenter ants’ prime food source is plant pests, especially aphids, scale, mealy bugs, and others that produce honey dew. Inspect your plants. Trim back shrubs and trees that touch your structure. Portland Pest Guard has multiple professional treatment strategies to eliminate a carpenter ant infestation. After inspecting the structure and surrounding landscape, your specialist will work with you to determine the best approach for your situation.